Made in considerable numbers both before WW2 and from 1951 onwards, when it was re-introduced, the Model S was the most common of the smaller and cheaper Portass backgeared and, screwcutting range of lathes Although there would have been ample scope to allocate the various adaptations of the Model S Model designations - or at least identifying numbers - just like the company's determination to use "Dreadnought" to describe all their larger lathes, the label "Model S" was applied to a number of lathes all with different capacities and specifications. Unfortunately, Portass appear to have been rather casual about Model and Types designations and it is not known for certain how (or even if) the factory catalogued the very first examples made during the late 1920s. With bed and headstock cast as one (and a long foot under the bed gap) a compound slide rest, round leather "rope-drive" headstock pulley and a set-over tailstock these were distinctly different in details to later versions, in fact sufficiently so as to allow them to be designated as the Mk. 1 and later types as the Mk. 2 . Of the latter, least four versions were offered with centre heights of 3" (to swing 71/2" in the gap); 33/8" and 35/8" and between-centres' capacities of 121/2" and 18". Each type also featured a number of minor differences in detail and appearance with some models (usually the basic 3") having a simple, swivelling top slide while others (usually, though not exclusively, the larger versions) had both a T-slotted saddle and cross slide and a proper top slide with 21/2" of travel. 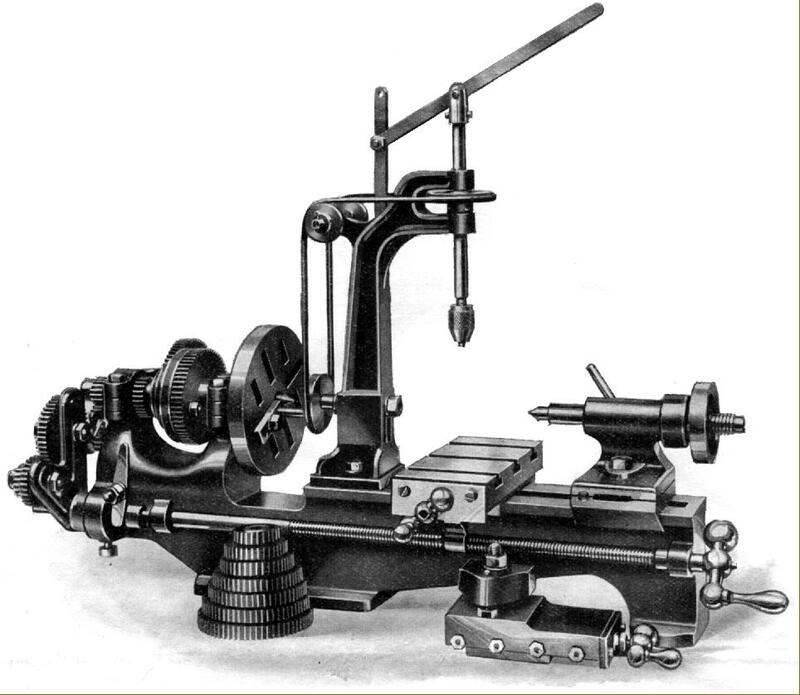 The first illustration below shows one of the last made (in the mid 1950s); this had a redesigned bed some 35/8" wide with vertical stiffening ribs cast into the section beneath the gap, a larger 1" diameter, 3/8" bore spindle running in split, bronze bearings, a 1" tailstock barrel and a compound slide rest with a thinner top slide. The dog-clutch lever was straight and pointed downwards - rather than being dog-legged and set upright as on earlier machines. An even more heavily modified version of the "S" was also produced, although it is impossible to say if it was manufactured simultaneously with other types (and perhaps built at the request of a retailer) or just a more highly-developed example. The main improvement centred around a headstock with a heavier and stiffer build with the bearings braced by raising the front of the casting until it was level with the bearing clamp slits. 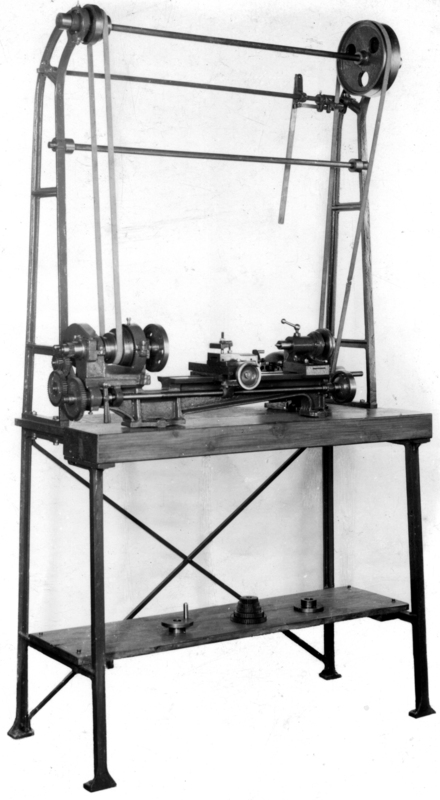 A longer cross slide with transverse T-slots was used and the headstock (almost identical to that on the final Portass lathe, the PD5), was also fitted on at least one version of the lathe sold under the Gamages label. Most S-Types appear to have been supplied with a full compliment of 16 D.P. screwcutting changewheels comprising: two x 20t, 25t, 30t, 35t, 40t, 45t, 50t, 55t and 60t with both a 65t and 63t available, at extra cost, for metric conversions. Other equipment supplied as standard with a new ma chine included a faceplate, a spare chuck backplate and a catchplate. In 1951 the "S" was priced at £28 : 10s : 0d for the short-bed 3" model rising to £32 : 10s :0d for the 18" between-centres long-bed. A useful if limited range of extra was offered including: a choice of a simple bench-mounted, non-tensioning countershaft (termed the Mk, 5) at £2 : 19s : 6d or a rather more effective fast-and-loose unit (the P.D.5 from the smaller version of the Dreadnaught) for bench, wall or ceiling mounting at £4 : 15s : 0d. 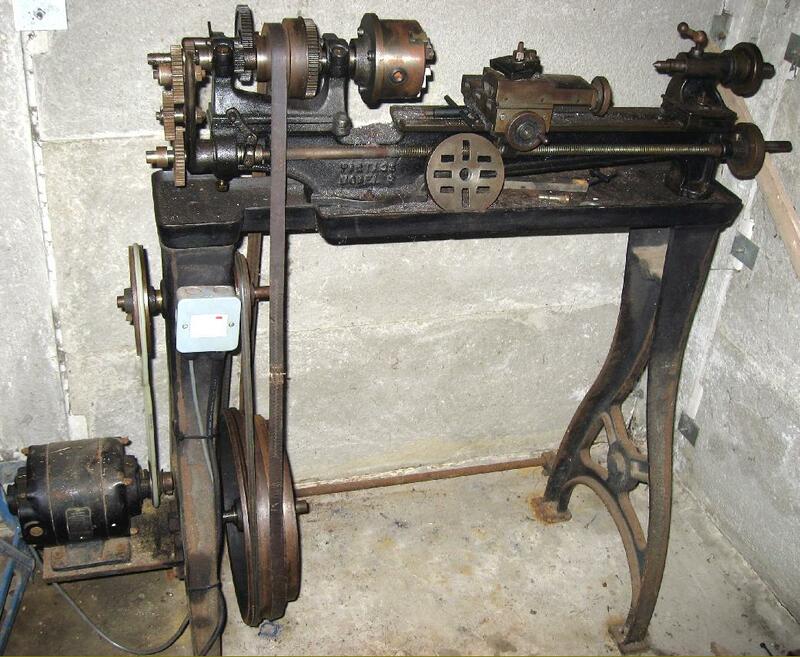 A stand and chip tray in cast iron could be supplied, though at £9 10s : 0d this was relatively expense, as was the addition of treadle gear and flywheel with that assembly, including the stand, retailing for £16 : 0d : 0d. The impecunious, who also wished to save on electricity, could choose instead a "foot motor" with its 46 lb flywheel and rig up their own bench - perhaps even splashing out on the special cast-iron chip tray sold for that arrangement. Fixed and travelling steadies, plain and swivelling vertical milling slides, extra changewheels, Morse centres, electric motors, Burnerd chucks and cone pulleys to help the new owner to construct his own drive system were also listed. 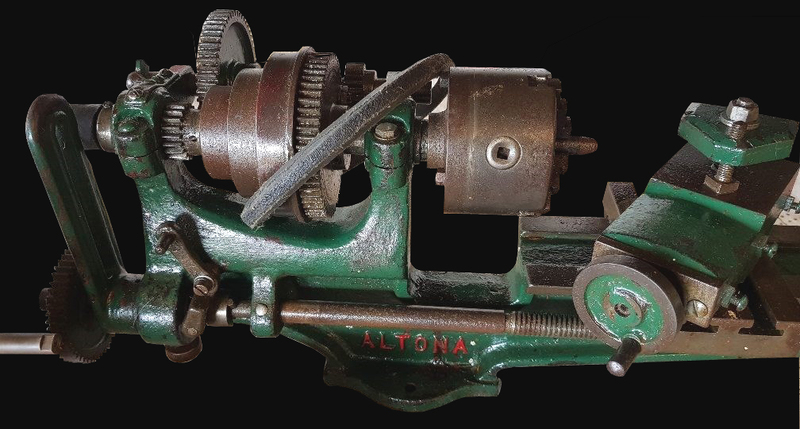 A number of firms - some associated with machines tools and other simple retailers or mail-order concerns - are known to have bought in Portass lathes and badged them as their own including: Portass was also kept busy supplying machines for retailers to re-badge as their own and examples have been found marked: Altona (shown below, and here, and only discovered, so far, in Australia - so possibly named after the Melbourne suburb), A.T.M., B.I.L., Bond's Maximus, Companion (sold by Johns in Auckland, New Zealand), "Eclipse" (for the Sheffield hand-tool makers James Neil & Sons) Excell, G.A. (George Adams), Gamages, Graves, James Grose Ltd. of London (the latter chiselling off the Portass name and substituting their own badge), Juniper, Randa, Temmah, Wakefield, Woolner and Zyto, All appear to have been based on established Portass models, nearly always a version of the "Junior" or the venerable "S Type", although in every case some small differences, usually down to cost-cutting, can be found. Not every Gamages' lathe was by Portass, the company being well known for re-branding lathes from several other makers as well. If you have an example of a Portass badged as other than the examples already discovered (those with hyperlinks) the writer would be interested to hear from you. Unfortunately I have nothing to add to your excellent description of Portass lathes but in the late 1960's, when I was looking to buy a lathe, the choice lay between an ML7 and a Portass S which was, at the time, more within my means. However, despite the extra cost, I eventually choose the Myford - £120 including a 4-jaw chuck and a Jacobs drill chuck. There was no motor but I adopted one I had acquired to fit. I still have this lathe (2008) and it has served me very well. However, about twelve years ago, I saw an advertisement for a Portass S complete with motor and a vertical slide for £120 ponds and, looking back, just I had to buy it. 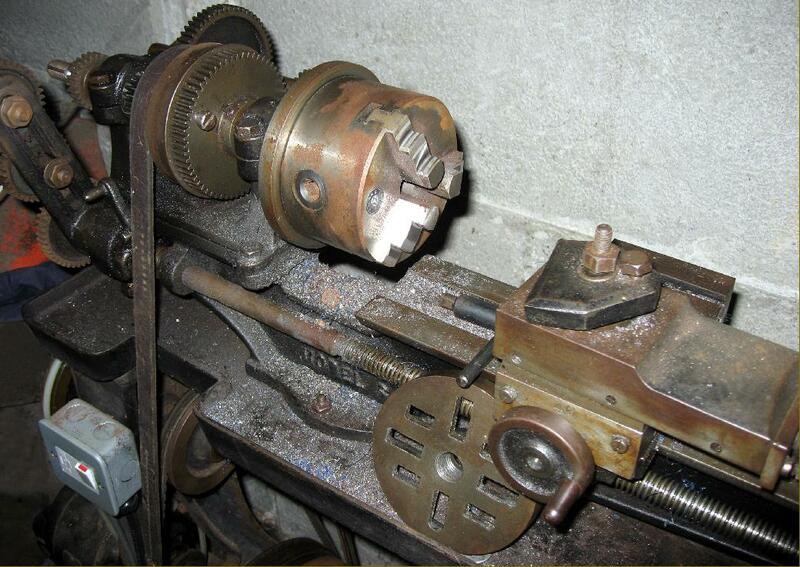 Since that time it has been is the most used lathe in my workshop and has earned what I paid for it many times over. I must admit that I do not use it very often when screw-cutting, but it's a challenge I sometimes submit to! On the Portass everything comes to hand - I cannot describe it in words, but it just happens. Anyone who manages to get a Portass lathe will not be disappointed. Portass Model XL - in effect a very early version of the Portass Model S Available in two models and several forms, some with a specification rather superior to that normally found on other Portass lathes of the early 1930s, the Model X.L. had its headstock and (gap) bed cast as as-one, a forked changewheel bracket, round rope-drive to the headstock pulley, a full compound slide rest, a 6 : 1 ratio back gear, a dog clutch and, most surprising of all, the option of tumble reverse to the leadscrew drive. The centre height was 3 inches with either 12.5 or 18 inches available between centres. Just visible in the picture below is, below the left-hand spindle bearing, a slight radius to the casting - an area intended to accept the plunger indexing holes for a tumble-reverse mechanism. Also available was a cheaper model advertised as the "X". Based on the X.L. this lacked all the features that made the X.L. so useful and made do with a single swivelling tool slide, no set-over to the tailstock or tumble reverse, a spindle running direct in the cast-iron of the headstock and, to make screwcutting more difficult to set up, a single-slot instead of a forked changewheel bracket. Photographs of a Zyto version here. Numbers of Portass S Types have been discovered fitted to simple, treadle-equipped stands. This illustration shows the hand of the touch-up artist with lines removed, highlights added and castings smoothed to an unrealistic, Rolls-Royce like finish. When production of the Model S resumed in 1951 the detail design was improved, many components strengthened and the some significant changes made to the headstock assembly - bearings with detachable caps being fitted, the centre height increased to 35/8". The option was also offered of V instead of flat-belt drive - though strangely this option seems to have been a minority choice. The bed was beefed up by cast-in "bars" running along its edges and vertically below the gap, the slide rest became a compound type and the tailstock was given a sole plate (that allowed off-set for taper turning) and a long handle provided to operate the bed clamp - instead of a nut hidden at the back. The machine shown below is not entirely original. Strangely, not all these improvements were maintained, with many examples leaving the factory with the older design of split headstock bearing and occasionally a non-compound slide rest as well. The vertically-disposed radiused casting immediately below the left-hand headstock bearing was obviously intended to carry the indents for a tumble-reverse mechanism, but no Model S has never been found with that refinement. However, the same headstock, adapted for use on the last lathe to be developed by the Company the PD5 was so equipped. Proper 2-bolt cap bearings were used (pictures above and left) - in this case with a non-original oil cup. The backgear cover, visible to the left of the oiler, had to be removed before the gear could be engaged - a small lifting handle was provided on the top. The bed was braced by cast-in "bars" running along its edges and vertically below the gap. 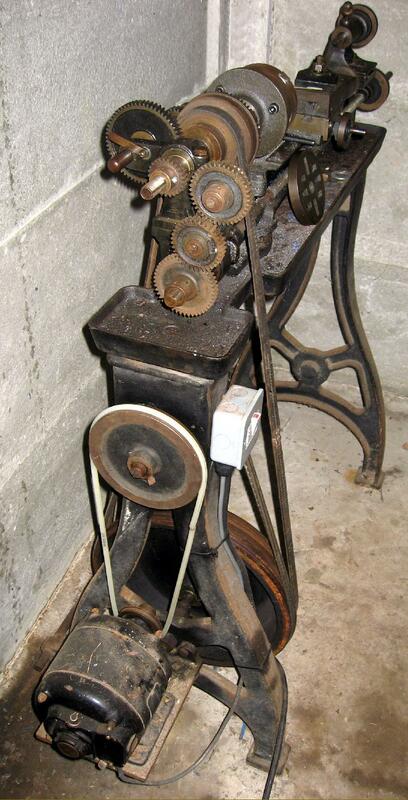 The machine was greatly improved by the fitting of a compound slide rest - the cross-feed handwheel is not original. Full nut on the leadscrew, with a non-original (but useful) chip guard. Tailstock with larger barrel, more robust base to top connection and a long handle for locking and unlocking - instead of a nut hidden at the back.